The Saga continues. Since my last ponderings about the Strange Fruits on Fence-Posts, I have been actively searching for further specimens. To no avail. This summer has been a slow season for Fence Fruit, I can tell you. All these wrought iron fences, and nary a fruit to be found. Fences, fences, everywhere, and not a fruit to shoot. 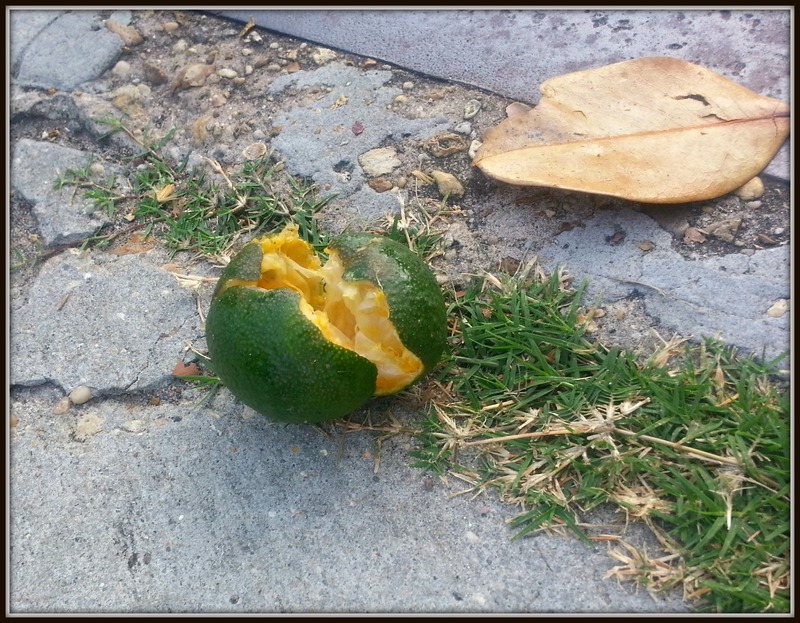 Now, it could have simply been an innocent lime, tossed in neglect upon the grimy pavement. Observe how it has been sectioned. Peer, if you will, at the obvious way that it has been cleft in thrain. Ponder over its three parts. 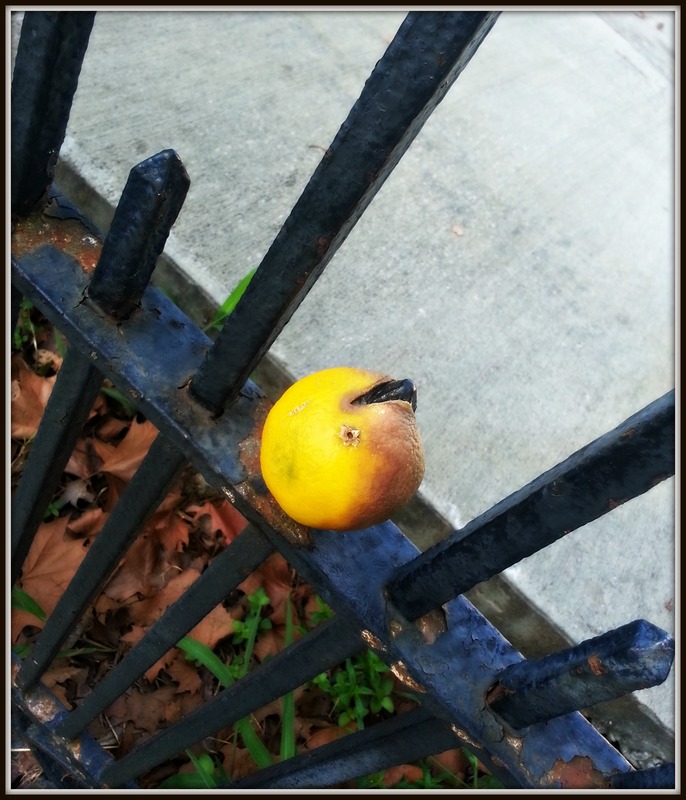 And then tell me that it’s not a lime wounded by an iron spear of neighborhood fence. So, much to the befuddlement of the girl walking past me on the way to yoga (you can always tell when a girl is on the way to yoga), I crouched and took about 4 or 5 shots of this poor wounded lime before I merrily went my way down the street. I was convinced that much time would pass, eons mayhap, before I was once again honored with the opportunity to espy another fruit. I hoped that, should my day come, it would be staked upon a fence instead of residing upon the (not) cold ground. However, I was resigned to months of observation and a long wait. Yesterday, my dear friends. YESTERDAY! I was once again walking my well-trod morning path when what should I see? I saw THIS! I think I Yawped out loud (barbarically, even) and danced a wee Leprechaun jig in the middle of the sidewalk before stopping and capturing my treasure. This time, it was a gal sitting in her car who was befuddled. Actually, I couldn’t tell due to the tinted windows, but I like to think that I befuddled her, at least. I did a Google search this evening to see if this was something that even HAD and explanation, something that other people have talked about or noticed. Walking home in the thunderstorm this afternoon, I kept having visions of it being some sort of gang sign, or maybe something equivalent to the bra hanging on your roommate’s bedroom door knob. -My favorite: An announcement about boxes of fruit being hung off a particular fence for homeless folks. Nothing about the slow Vlad Dracul torture of an innocent piece of citrus. I like to picture something along the lines of the activity captured in the pages of two profound tomes of my childhood, heartily writ by James Howe: Bunnicula and The Celery Stalks at Midnight. Chester the cat and Harold the dog, at one point, set forth to stake the white, limp, drained corpses of many a vegetable to keep them from rising as the Undead bastions of doom. Alas, in this case, ’tis fruit taking over my city and not vegetables, and their hearts are cleft by iron, instead of wood. Ah, the memories those two titles bring back! I can totally understand the reaction other people would have with you shooting pictures of these sorely wounded lime, oranges, etc. I understand it though, isn’t that scary?